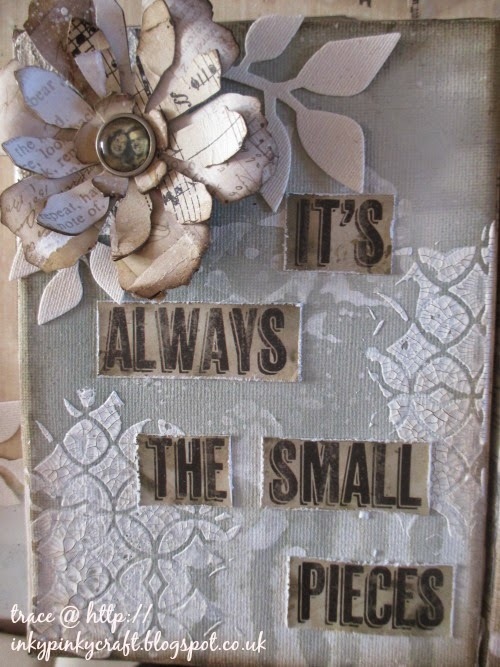 A Vintage Journey: Destination Inspiration #3 - It's the small things ..
Destination Inspiration #3 - It's the small things .. 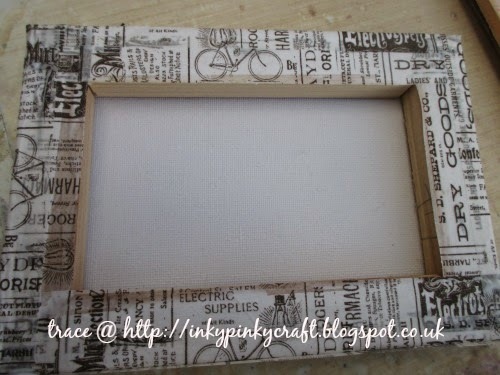 I decided to use the inside of two canvas pieces to create a hinged piece, allowing me to decorate not only the front but the inside of the two canvas pieces too. 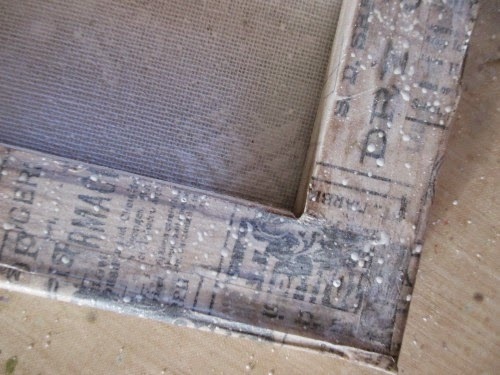 I will save the covers of this piece, or the outside of the canvas later on in the post..
To start I covered my canvas frames with tissue tape, to covered the join of where the canvas was stapled on .. 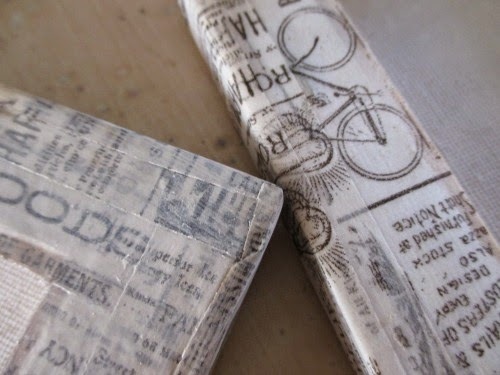 I extended the tape around the sides, careful not to overlap onto the front of the two pieces. I then applied some picket fence distress paint to soften the detail of the tissue tape.. Continuing when the paint was dry with walnut stain distress ink and splatters of picket fence distress paint. 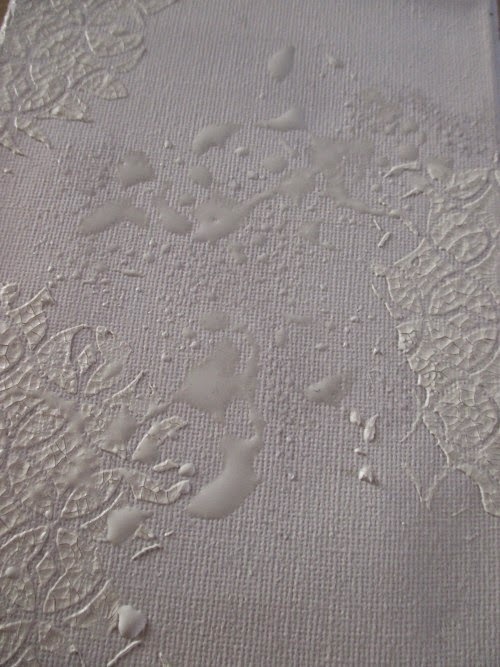 I picked up the paint using a splatter brush from distress paint applied direct to my craft sheet and spritzed lightly with water. Now for the fronts of the canvas... 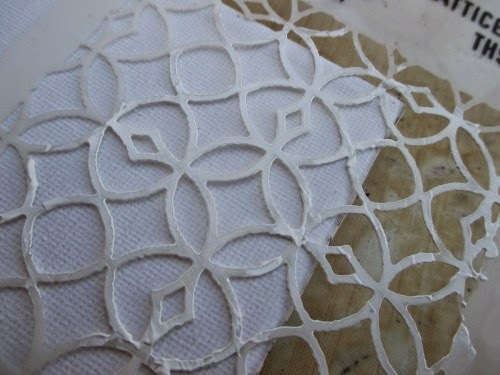 I started by applying some decoart media crackle paste through the latticework stencil..love this stencil so much! I applied in areas on both of the canvas fronts. 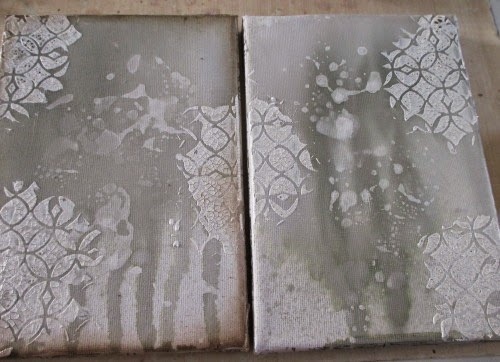 I then applied some picket fence distress paint direct to my craft sheet and sprited, dabbing the canvas fronts into the paint..and allowing to dry . 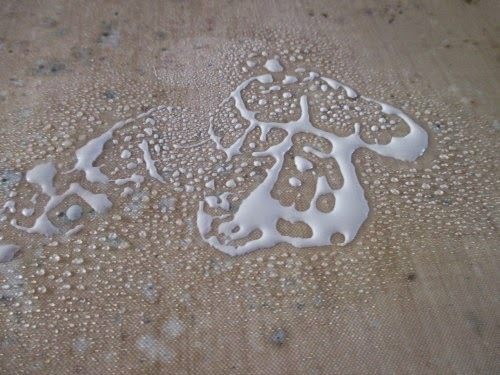 When dried I sprized some pumice stone distress spray stain onto the top of the canvas , spritzed with water and allowed to drip , the heat dried . When dry I added some walnut stain distress ink around the edges using a blending tool, it is amazing the difference these small touches make...and I think walnut stain distress ink makes anything and everything look better! 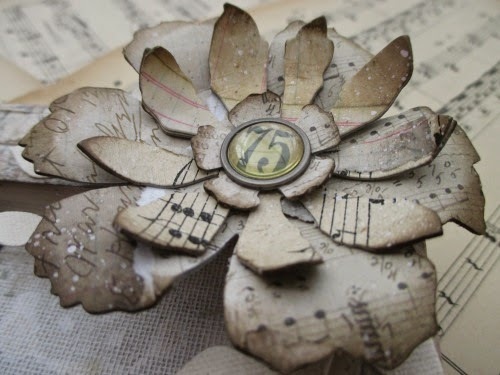 Now for the flowers, made using Tim's tutorial , Grungepaper flowers (Vol 1 of Tim's CC3C Book, page 65). 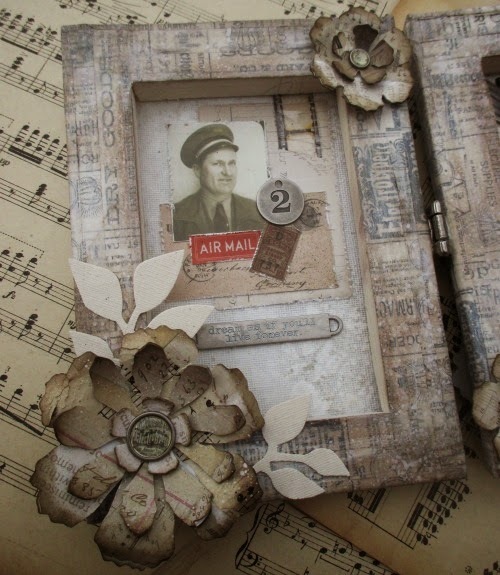 I used various vintage papers and papers from Tim Holtz paper stash collections and edged the flowers in walnut stain distress ink. To complete the flowers I added more splatters of picket fence distress stain and some of the idea-ology custom fastners. To complete the covers..I added one of the pocket cards , cut into pieces and distressed and some sticky backed canvas leaves , die cut using spring greens die. 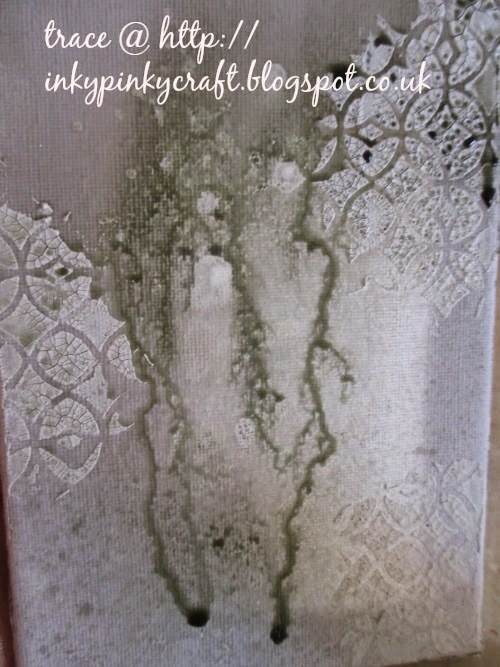 I love how the picket fence paint has resisted the distress stain spray in the background...and still think this is such a cool property of the distress paints that they react with water until dry and then are permanent. 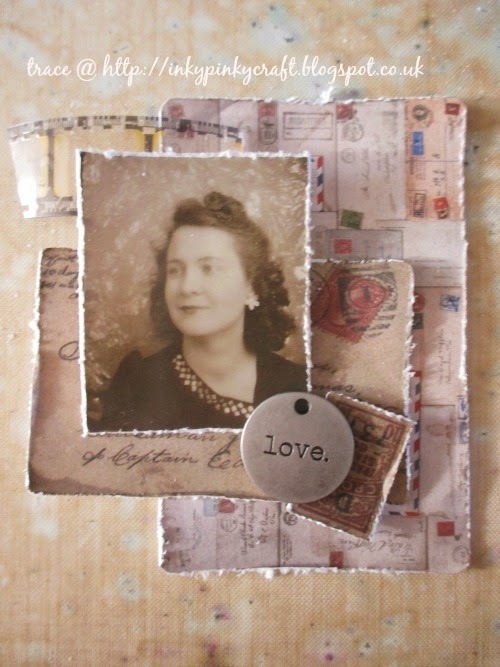 I collected together elements from ephemera packs, pocket cards, idea-ology and distressed edges playing around until I was happy with the layout of the pieces. I added a photo booth photo to the centre of each collection. I tend to collect lots of pieces and then discard pieces that don't seem to fit..
here is the collection for the left hand side..
and here is the collection for the right hand side..
Now to finally add them to the inside of the canvas pieces ..
so to complete the left hand side some more grungepaper flowers and canvas leaves around the frame created by the inside edge of the canvas. and the same for the right hand side .. Finally to join the two pieces together I added an idea-ology hinge. So hope you liked my make and make sure you stop back next week for another destination inspiration using the same recipe . Lovely canvas and that's a double bonanza. I enjoyed reading the process and can't agree more on the magic of Walnut stain! I love that ink too. the tissue tape background is beautiful and is an amazing backdrop. Hugs. What a great project Trace. 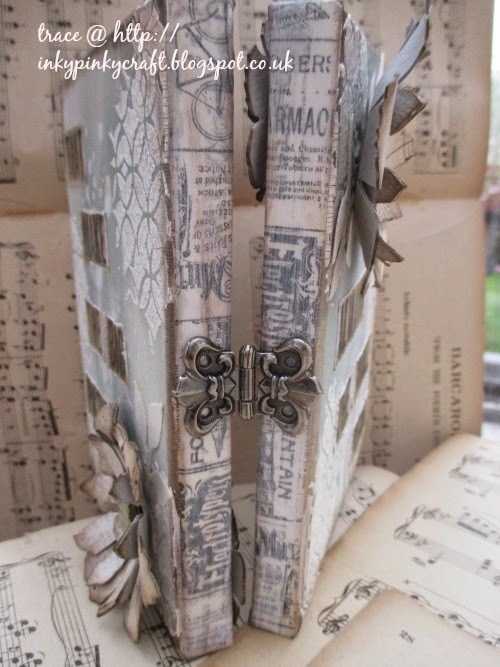 I love the way you hinged the canvas together and all the elements on the inside and out. The way you added the Picket Fence made the entire thing come together. Thanks for sharing your wonderful ideas. Great project Trace. Love the hinge. Absolutely brilliant Trace, the detail is amazing! What a great tutorial and the end result looks fantastic! Wonderful to have you with us again! An absolutely stunning creation, Trace... I love Jenny's Scandi-Wild West description! Beautiful delicate ink and paintwork and fabulous textures throughout. 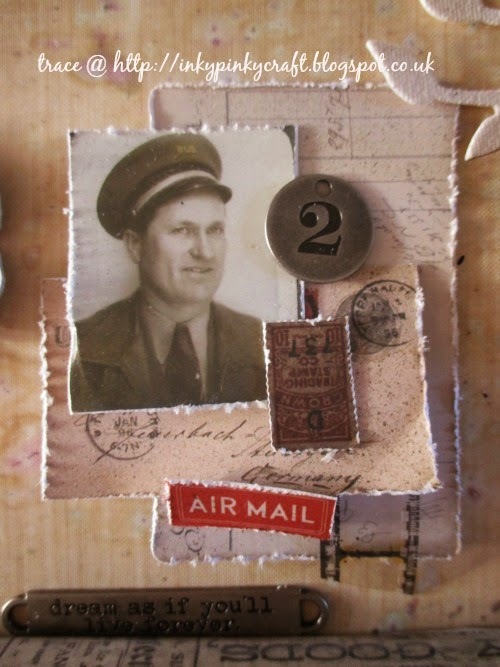 And lovely collaging to finish it all off - a showstopper! Gorgeous, glorious, magnificent. Love this Trace - it's a fabulous DI creation and post. Amazing project!!! Love all the details and paintwork with stunning textures! Awesome ... Love the Canvas .. !! Stunning project Trace and so beautifully showcased. 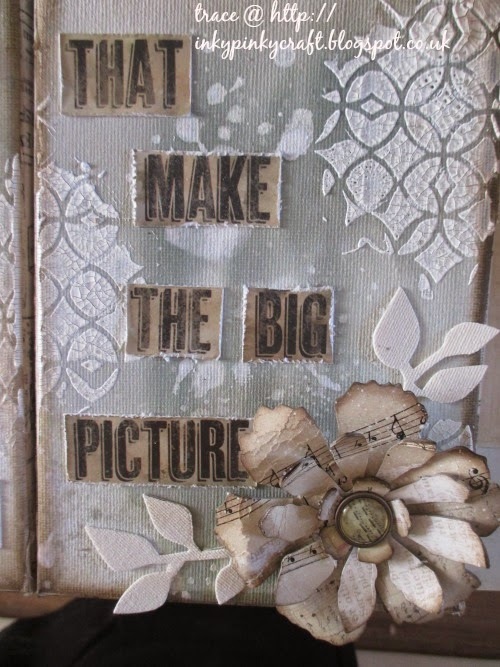 Love every detail on your canvases. A beautiful make Trace with gorgeous details. 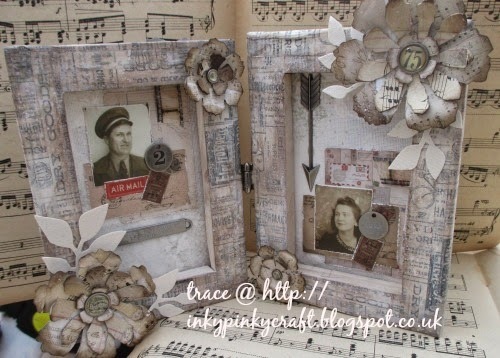 Love the stencilling and painty layers. Stunning florals too. Thanks for sharing such a great step by step. In awe - definitely INSPIRATION... Wow. Thank bunches Trace for the wonderful tutorial too. So happy to learn from you. j. Trace, this is total fabulousness! 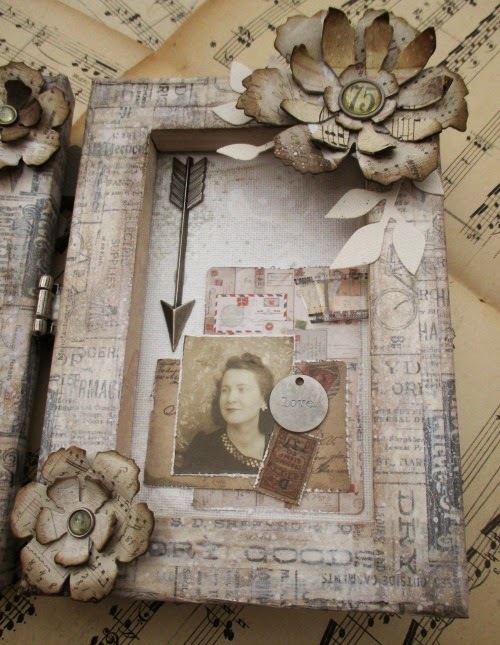 What a clever idea to add the hinge to the canvases and love all the textures and flowers! Hugs! Wow Trace, that is so fabulous! Love how you hinged the canvases together and all your beautiful distress techniques. 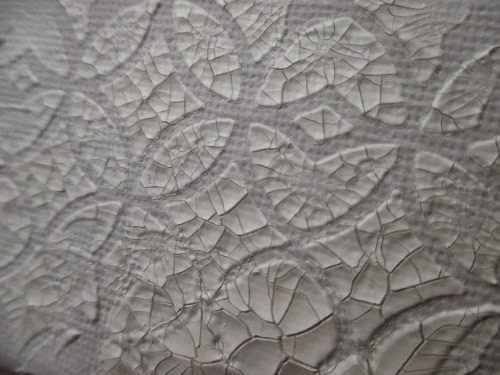 Fabulous textures and so much interest with this beautiful monochromatic colour palette, love!